Topaz is the birthstone for November, and with November right around the corner, now is the time for November birthday shopping. Topaz is naturally found in a variety of colors, but it is most commonly found in different shades of yellow. It is also interesting to note, that pure topaz is actually colorless and transparent, but the colors we are familiar with are caused by impurities. Topaz is believed to have calming and healing qualities. Some say it proves loyalty among friends by changing colors near poison. 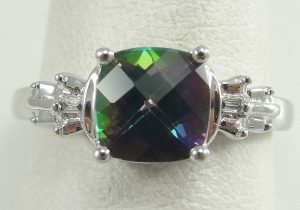 This particular ring is made from mystic topaz, which is a colorless variety of topaz that has been treated to give it this beautiful rainbow appearance.